For some reason, when we go to this restaurant, we always seem to be ravenously hungry. Part of that is that sometimes there can be a long wait and after 45 minutes to well over an hour, our stomachs are grumbling quite loudly by that point. :) So, when we sit down to eat, we have only one thought on our minds -- digging into our meals. :) So it's best to keep all limbs tucked away safely. Haha! However, at no point during those previous restaurant visits did I ever think, "Hmmm, well maybe I could try making these tamales at home." I was usually so hungry by the time the food arrived that I was just focused on devouring them! I think it had something to do with Cinco de Mayo. I'd created a recipe in honor of the holiday, and then began to think about all sorts of Mexican dishes that I enjoy. 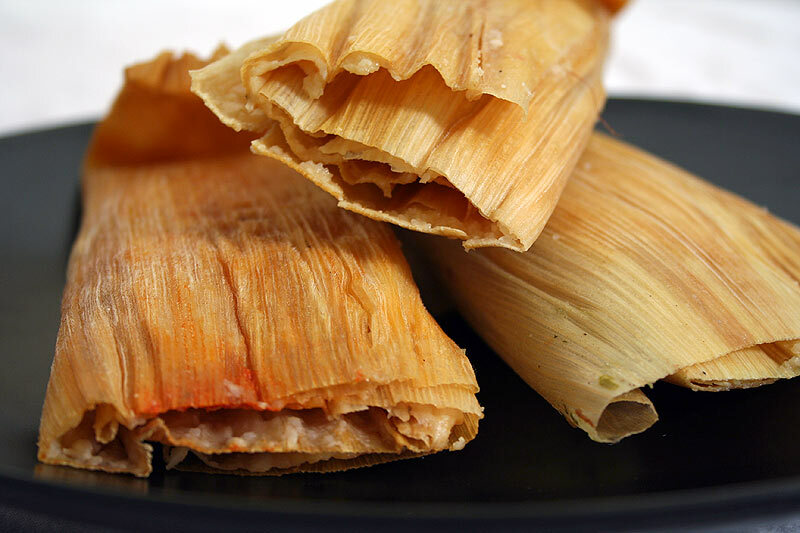 One thought led to another, and I realized that, even though this blog already contained a multitude of Mexican recipes, I'd never posted a tamales recipe before. And it seemed like this was a grave omission. OK, let's face it. Until just yesterday, I'd never made tamales before in my life, let alone posted a recipe for them. :) I guess I'd just never had the occasion to do so before. But as I've become more and more adventurous in my cooking over the years, I thought, "Hey, waitaminnit, I think I can do that." Sure, why not. :) I'd read a bit about tamale-making, and most sites describing the tamale-making experience as "easy, fun, and oh yeah, you might want to take the afternoon off." LOL.